Hinshaw, Harold, head-of-household, age 27, born in Indiana; on Apr 1 1925 was living in Gary, Lake County, Indiana; completed 4 years of high school; owned home ($3000 value); occupation: cinder snapper, steel mills; worked 52 weeks in 1939, $1300 wages. Hinshaw, Marion, wife, age 29, born in Indiana; on Apr 1 1925 was living in Gary, Lake County, Indiana; completed 3 years of high school. Hinshaw, Norma Jean, daughter, age 2, born in Indiana. 1940 census, Calumet Precinct, Lake County, Indiana; roll T627-1064, ED 45-3, page 59A, line #6, household #1147. 1920 census, Gary, Calumet Township, Lake County, Indiana; roll T625-446, ED 126, page 9B, line #72, dwelling #206, family #213. 1930 census, 9th Ward, Gary, Calumet Township, Lake County, Indiana; roll T626-600, ED 63, page 7A, line #1, dwelling #135, family #138. 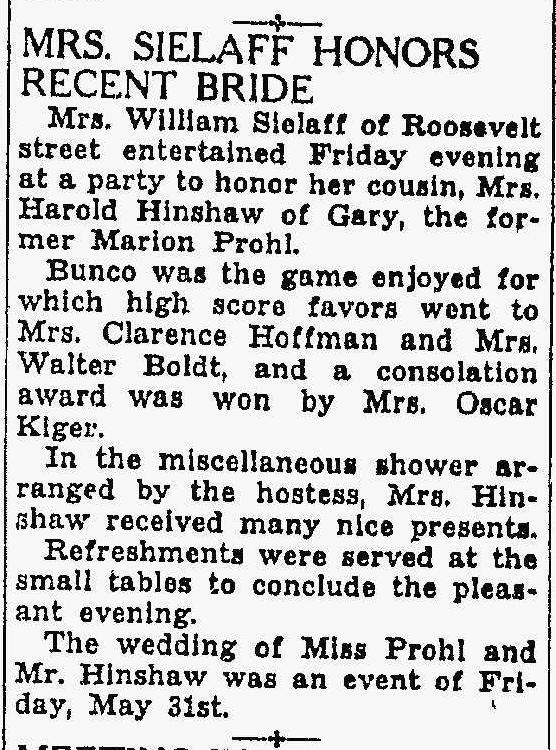 "Hammond Times" (Hammond, Indiana), Jun 22 1935; http://www.ancestry.com. Ancestry Family Tree data "Lockwood's Family & Descendents_2009-12-28_2011-05-12_2011-05-22" posted by "richardlockwood1". Ancestry Family Tree data "Lohse Family Tree" posted by "lh860". U.S. City Directories, 1821-1989 (Beta); http://www.ancestry.com.